The Hard Bargain describes in vivid detail and elegant prose the clash of wills between a famous father and his hard-driving middle son. Richard Tucker, the American superstar tenor from the golden age of the Metropolitan Opera, demanded that his son become a surgeon. Rejecting his father's wishes, David wanted to follow his father onto the opera stage. Their struggle over David's future -- by turns hilarious and humiliating, wise and loving -- is played out in medical and musical venues around the world. The father and son strike a bargain, the hard bargain of the title, which permitted both dreams to flicker for a decade until one (the right one, it turns out) bursts into sustaining flame. This heartfelt memoir about a son's struggle against the looming power of a magnetic father is conveyed in a moving narrative that one reviewer has called "the most dramatic exploration of the private life of a legendary singer in the annals of opera literature." Dr. David N. Tucker is a retired ophthalmologist with degrees from Tufts University and the Cornell University Medical College. After an internship at Mount Sinai Hospital in New York City, he was a commissioned o cer in the U.S. Public Health Service at the National Institutes of Health, doing research in infectious diseases during the Vietnam War. As chief resident under Dr. Edward Norton at the Bascom Palmer Eye Institute in Miami, he accepted a one- year fellowship with the eminent Colombian microsurgeon Dr. José Barraquer and with other prestigious ophthalmic surgeons in Europe. For over thirty years, Dr. Tucker was in private practice in Cincinnati and was the director of the Department of Ophthalmology at Cincinnati Jewish Hospital for twenty-seven years. After retiring in 2004, he taught part time as a clinical assistant professor of ophthalmology at the NYU School of Medicine. He and his wife Lynda celebrated their golden anniversary in 2013 and have four children and nine grandchildren. Burton Spivak received his PhD in American History at the University of Virginia where he was a Woodrow Wilson Fellow and a Virginia- Danforth Fellow, and taught at the University of Texas at Austin, Brown University, Bates College, and the University of Virginia. He is a former recipient of the Stuart L. Bernath Lecture Prize for excellence in teaching and scholarship, awarded annually by the Society for Historians of American Foreign Relations. His book Je erson’s English Crisis: Commerce, Embargo, and the Republican Revolution (Charlottesville, Virginia, 1979) was included in C-SPAN’s American Presidents: Life Portraits list of twenty-five recommended books on omas Je erson. Spivak also received his JD degree from the University of Virginia where he was on the Law Review and Order of the Coif, and practiced tax law in New York City for many years. He currently is an Adjunct Professor of History at Sacred Heart University in Fair eld, Connecticut. -- Dr. GARY P. ZOLA, Executive Director of the Jacob Rader Marcus Center of the American Jewish Archives. David with his father, Richard Tucker, at a performance of La Juive. 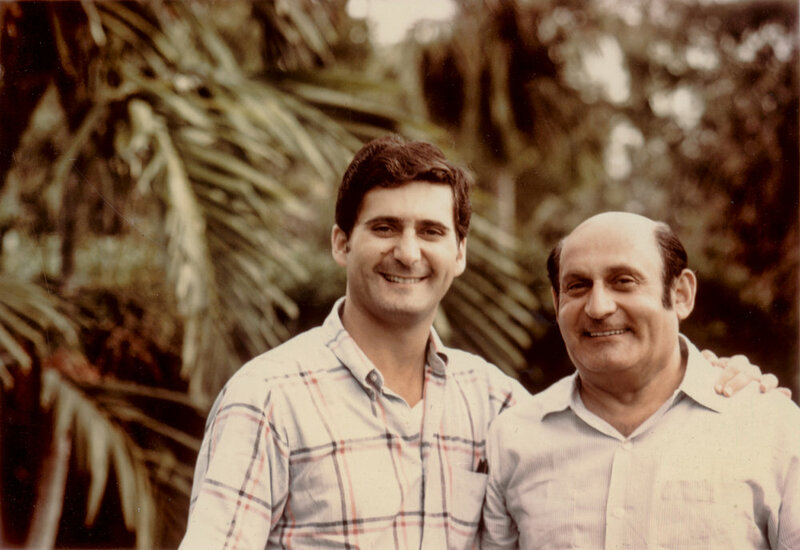 David with his dad in Miami during his eye residency. David auditioning with the great tenor, Lauri Volpi, with Richard (far right) looking on. Sign up with your email address to receive information about The Hard Bargain availability, and progress on the play, Divo and Diavolo. We respect your privacy. This list will not be shared. You may subscribe at any time. Thank you for your interest. Please watch for an email from us and follow the instructions to complete your subscription. You may unsubscribe at any time. When a talented young man chases dreams of opera stardom, he clashes with his legendary father (Metropolitan Opera icon Richard Tucker). 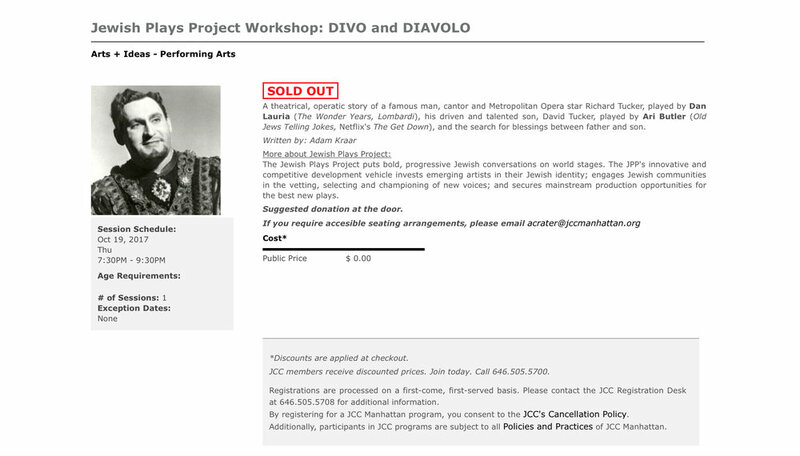 DIVO AND DIAVOLO is a comedy with music about a son's quest to win the elusive blessings of his father - and the crazy bargains he makes along the way. Dr. Tucker – a doctor whose medical career included studying with some of the most renowned surgeons and researchers in the world – is the second of three sons of the famous tenor. After retiring from his large Cincinnati-based practice and from teaching at NYU Medical Center, he wanted to share this beautiful family story. Focused on David, the play tells the story of a father and son at war over the younger man’s future. David desperately wants to be a singer like his father, but the elder Tucker, a devoted and traditional Jewish patriarch who never graduated from high school, has decided that David will become an educated man and a doctor. The play was developed by the Jewish Plays Project (Executive Artistic Director David Winitsky), the nation’s premiere incubator for new Jewish plays and musicals, using its signature Jewish dramaturgy method. Adam Kraar’s plays include ALTERNATING CURRENTS (The Working Theatre); WILD TERRAIN (EST Marathon of One-Act Plays); EMPIRE OF THE TREES (NY Innovative Theatre Awards nominee, Outstanding New Script); NEW WORLD RHAPSODY (Manhattan Theatre Club commission); FREEDOM HIGH (Queens Theatre in the Park) and DANCING ON THE EDGE (Southern Theatre in Minneapolis). His work has been produced and/or developed by Primary Stages, N.Y. Stage & Film, Public Theatre, The New Group, Bloomington Playwrights Project and many others. His plays appear in six BEST AMERICAN SHORT PLAYS anthologies. Awards: Bogliasco Fellowship, Sewanee Writers’ Conference Fellowship, and Manhattan Theatre Club Fellowship. Member of Ensemble Studio Theatre; Affiliated Writer, The Playwrights’ Center. M.F.A., Columbia University Adam grew up in India, Thailand, Singapore and the U.S.
We respect your privacy. This list will not be shared. You may unsubscribe at any time.